Set each team on opposing sides of field with the midfield line as your center. Each half of the field represents your yard. Coach takes all the balls and starts distributing them equally on each half of the field. Count the balls remaining on each side to designate the winner. 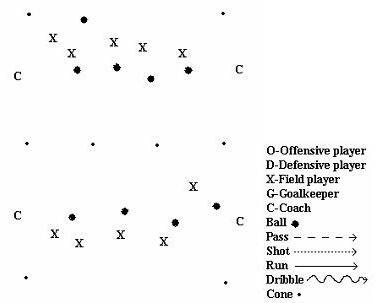 Modify the game in future practices by breaking down the half field into half again. Assign defensive and offensive players to stay in their quarter. Promote the passing from the defense up to the offense to get the ball out of their yard. For fun do it with some parent volunteers. Parents vs kids. Rule for parents is balls must stay on the ground.